I'm sure you all know that October is Breast Cancer Awareness month. I've got a couple of badges up on my right sidebar showing my support, and if my blog wasn't pink already, I would have gone Pink in October to show my support even further! I did so last year, and I think - the year before. Although I personally don't have anyone in my family that has been affected by Breast Cancer (that I know of), I'm adopted and do not communicate with all of the members in my birth family, so I can't be too certain if it's in my family history or not. (And yes, that worries me!) Years ago, I found lumps in my breasts - 3 of them to be exact. I was YOUNG (19) and had just had my second child. I saw 5 doctors before I was told that they were lymph nodes and that it was up to me if I wanted them removed or not. Needless to say, I still worry about those lumps but they don't give me trouble, so until they do, I chose not to go under the knife. That's part of the reason I want to share PinkTogether.com with you! On PinkTogether.com everyone can share hope by posting and reading inspiring stories of breast cancer survivors and supporters within the community. The site is part of Pink Together® (an online community on MySpace), a national campaign to support those impacted by breast cancer and to help raise awareness of the disease. To support Pink Together, General Mills is donating $2 million to Susan G. Komen for the Cure® and is turning the packaging pink next month on an assortment of its most beloved brands. General Mills will also donate $1, up to $20,000, each time you post a comment of encouragement, send a virtual flower bouquet or share a story on PinkTogether.com in October. I encourage you to go to PinkTogether.com and view the inspiring stories, as well as visit Pink Together's YouTube channel and view the videos from the 2009 Pink Together Survivor Ambassadors talking about their journeys with breast cancer. In conjunction with this campaign from MyBlogSpark, I was sent an Inspiring Hope gift basket (pictured below) that includes a sleeved travel mug, a running ribbon charm bracelet, a pink leather strap keychain, a pink cinch bag, and a set of inspirational note cards. All of the gift basket items are from ShopKomen.com, where 25 percent of the merchandise purchase price benefits Susan G. Komen for the Cure® in the fight against breast cancer. Please tell me which woman in your life inspires you the most? This giveaway is open to US and Canadian residents, and will end on November 13th at midnight EST. Winners will be announced in a post here at A Simple Kinda Life and will be emailed. Winners will have 48 hours to claim their prize or a new winner will be chosen. 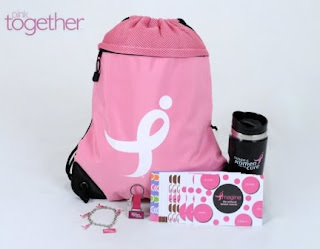 Thank you to Pink Together, who provided me with the information and prize pack through MyBlogSpark! Disclaimer: I was provided with a product for this post. Receiving a product will NEVER influence my opinions on a product. My opinions are mine, and yours may differ. My mother inspired me most, but since she's gone -- smart, spunky women like Ellen DeGeneres do :) *Thanks* for the giveaway! Great website and great giveaway! Thanks for the oppurtunity to enter. My mother is one of the most inspring women that I've met. She raised three girls, had a full time job, and she went back for her master's degree a few years ago. We were so proud of her when she graduated last may. I admire my sister. She is a single mother of two, who has been the sole supporter of her family. She works full time and also goes to school at night. She is an inspiration to me. My aunt inspires me, she recently beat breast cancer and has recovered wonderfully! My mom, who finished college with three little kids in tow.